A large crack has been found in the Wanapum Dam on the Columbia River which supports the utility power supply to a major cluster of data centers in central Washington state. The 2-inch-wide crack was found Thursday after divers were sent into the Columbia River because engineers detected a misalignment in a spillway on Wanapum Dam near the central Washington town of Vantage, said Tom Stredwick, a spokesman for the Grant County Public Utility District. The Wanapum Dam generates more than 1,000 megawatts of electricity for the Grant County PUD, the utility that provides electricity to major data centers operated by Microsoft, Yahoo, Dell, Sabey Data Centers and Vantage Data Centers. On February 25, dam officials noticed an irregular bowing of the dam near a section of a spillgate pier along the mile-long structure. Divers examined the area Thursday and discovered a two-inch wide crack running horizontally, located about 75 feet below the water’s surface. It runs the entire width of the 65-foot-wide pier. The risk of a failure of the dam is high enough that the county has initiated an emergency plan. To relieve pressure on the dam, the water level is being lowered by 20 feet. The Owen Falls dam in Jinja could cave in, if the cracks and damage to the dam are not repaired, an official of Eskom, the hydro power generation company, has said. Huge cracks continue to develop in the walls and supporting pillars of the dam. Water continuously sips through the gaping holes, expanding the cracks and making the dam weaker by the day. The Lake Manatee Dam in Bradeton, Florida is in a "severely distressed state" because of erosion, engineering consultants have found, forcing county officials to take corrective actions. Heavy rains over four or five days could compromise the Lake Manatee Dam, Manatee County government warned in a news release February 14. As a precaution, workers have begun to lower the water level of the lake. Engineers and officials are concerned that the dam's clay core may have been compromised. A dam on the Tokwe river in the Masvingo area of Zimbabwe is close to bursting as water from heavy rains finding its way through gaps in the uncompleted dam wall. Construction of the Tokwe Mukorsi dam began in 1998 but stalled in 2008. The dam was due to be completed at the end of last year but the deadline has passed with construction still not finished. Pictures from the area show water gushing through breaks in the wall and a huge build up of water in the reservoir behind it. Villagers have been evacuated as quickly as possible, with around 4,000 people believed to be at risk should the dam burst. According to the Daily News, the Zimbabwe Air Force is helping people evacuate. The Minister for Masvingo province is quoted as saying that the government is on high alert and "A helicopter from the AFZ has been airlifting some families who were marooned by the floods but we are not yet sure how many people are still marooned." "All dams will break either during the pole shift or in the months leading up to the hour of the shift. Look at the structure of the dam! It assumes that rock holding both sides of the dam will remain in place and not move. Of course these sides will move. This is a subduction zone! There is mountain building and even where the mountains are not being pushed upward, they are moving from side to side. Some parts are more fluid than others, which are more resistant during any earthquake thrust, so there IS inevitably movement to the side. They will pull apart, slide forward or backwards, but in any case the water will find its way around the dam." ERBIL, Kurdistan Region – Heavy rainfall has left three dams in Duhok province on the brink of collapse, according to local officials, who say the government is ignoring their pleas for help. Meanwhile, Darbandikhan’s hydroelectric dam near Halabja has vastly increased its power generating capacity. 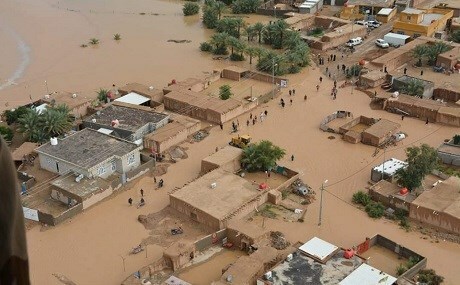 Since last week, the Kurdistan Region has seen extremely heavy rain leading to flash flooding, particularly in the provinces of Duhok and Sulaimani. Roads and bridges crumbled as soil was rapidly eroded from under them. “In all countries, there is a high committee for natural disasters, but there isn’t one in Kurdistan. We haven’t been able to sleep for four days due to being fearful of small dams collapsing,” Ziyad Abdullah, director of Duhok’s Department of Irrigation, told Rudaw. Kurdistan Regional Government (KRG) officials have not answered their pleas for assistance, he said. Besides Duhok’s large dam, there are 55 smaller ones. “We only needed 2 million IQD ($1,680) to mitigate the risks to these dams, but no one helped us,” added Abdullah. Concerned by the rapid buildup of water, engineers were forced to partially open Shiekhan dam to release the pressure. Besides the Shiekhan dam, Mam Shivan and Gre Gawre dams also face danger. “If we don’t monitor them, they might crack,” said Abdullah. It is not clear what damage would be caused to urban areas and farmland if any of these dams fail. International teams have been working to stabilize Mosul Dam, which remains in danger of collapse. If Mosul Dam fails, cites along the length of the Tigris to the Gulf could suffer inundation – including the capital Baghdad. Kurdistan’s Weather Forecast department has warned of further heavy rain from Wednesday. According to a five year plan (2013-2018) drafted by the KRG, 500 reservoirs and dams were to be constructed in Duhok. The financial crisis, however, prevented that. Just 55 have been built to date. Ramazan Hamzah, a geology expert from Duhok University, told Rudaw this year was very suitable for storing water – a resource desperately needed across central and southern Iraq. “Unfortunately, no use was made of that large amount of rain in the past few days. Instead of storing water, now there is danger of floods,” added Hamzah. The KRG has no strategy for underground and surface water, “at a time when big fights over water are underway,” he added. The Kurdistan Region does not suffer from serious water shortages. However, mismanagement and the lack of a culture of water conservation among the public leads to massive waste. Iraq’s central and southern provinces have seen a dwindling supply of water caused by climate change, drought, and a number of dams built upstream by Turkey on the Tigris and Euphrates rivers. Baghdad has even banned the cultivation of water-intensive crops. One dam in Halabja province has actually benefitted from the deluge. The heavy rainfall has boosted power generating capacity at Darbandikhan hydroelectric plant, which has brought two more turbines online. “Due to decreasing water levels, only one electricity turbine in the Darbandikhan dam was operational, but due to the increase in the dam’s water level, another turbine became operational, and on Monday, December 10, the third turbine will become operational,” Nasih Malla Hassan, mayor of Darbandikhan, told Rudaw. A single turbine produces 83 megawatts of electricity. The output of three combined turbines is 249, according to the mayor. Produced electricity has increased from 83 megawatts to 249 megawatts. In the past four days, there has been 180mm of rainfall in Dabandikhan, increasing the total this year to 390 mm. “Except for 2015, this is the highest amount of rain in the past 60 years in the district,” said Hassan. However, the rain has also caused serious local flooding – destroying the Darbandikhan-Kalar road. Darbandikhan’s dam is also not able to store the power created at this high capacity owing to earthquake damage. The Kurdistan Region suffers from regular power outages. In both the cold season and hot season, demand exceeds supply, critically shortening the hours of electricity. Heavy rains that started over the weekend saturated the ground and contributed to a partial collapse of the dam on the southeastern end of the Lakeview Golf Club lake here. The problem reportedly began around mid-day Monday, according to nearby residents. This was the second time the dam has collapsed at the local lake. The first occurred in 1979. There were no reports of injury or serious property damage at that time. The Syrian capital’s Adra district was left devastated by flooding caused by the collapse of the al-Dumayr dam in the western Damascus countryside on Saturday. Adra is seen as a vital district in attempts to revitalize Syria’s economy that has been ravaged by years of war. The official, who spoke on condition of anonymity, said that a technical malfunction caused the collapse. The dam has a capacity of 2.150 million liters and lies some 14 kms away from the industrial city. Dam workers were swept away by the rushing waters and many remain missing. The losses are estimated a millions of dollars, said the official. Residents of the industrial city were left trapped by the floods for several hours before rescue teams could reach them. The SANA state news agency reported that two children and a youth in the towns of Deir Muqrin and Kafir Zeit in Wadi Barada were killed. Dozens of houses were also damaged. Damascus and its suburbs witnessed similar devastating floods last year. This year’s flooding was compounded by the blockage of drainage pipes. The Damascus chamber of industry blamed the flooding on poor planning in the city and the rescue teams’ lack of preparedness. It demanded that authorities take the necessary measures to avert such disasters in the future and to compensate those affected by the flooding. A Duke Energy dam containing a 1,100-acre reservoir in North Carolina is breached, and may be causing coal ash to flow into the nearby Cape Fear River. Hurricane Florence brought rain measured in feet to North Carolina, followed by rising rivers and standing water in fields. The president of Duke Energy’s North Carolina operations, David Fountain, told CNBC earlier this week that the impact from Hurricane Florence has been the most severe he’s ever experienced. Floodwaters on Friday breached a dam that contains a man-made lake connected to a Duke Energy power plant in North Carolina, possibly causing coal ash to flow into the nearby Cape Fear River, the company said. The floodwaters flowed from Cape Fear River into the northern side of Sutton Lake, an 1,100-acre reservoir built in 1972 to cool the L.V. Sutton Power Station. 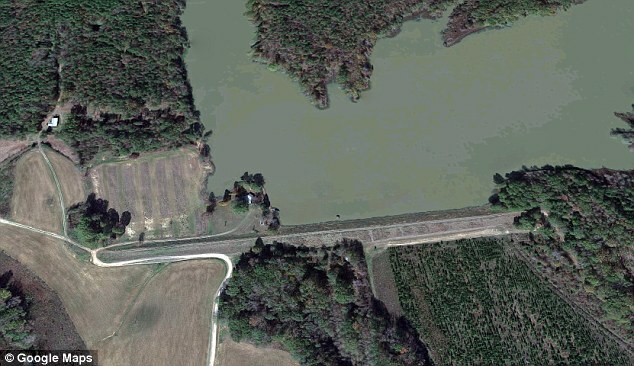 That water caused breaches in the dam on the south end of the lake, which was flowing back into the river, Duke Energy said in a press release. The 200-mile Cape Fear River flows into the Atlantic at Wilmington, North Carolina. The Sutton site in Wilmington was home to a coal-fired power plant until 2013, when Duke replaced it with a natural gas power station. Duke dismantled the coal-fired plant by 2017, but the grounds contained about 7 million tons of coal ash in waste pits at the time of its closure. There are still two coal ash basins on site. The flooding forced Duke to shut down the 625-megawatt natural gas plant, and the company is monitoring the coal ash pits. Coal ash is a byproduct produced primarily at coal-fired power plants. It contains contaminants harmful to human health including mercury, cadmium and arsenic. Heavy rain from Florence caused one of the coal ash landfills to partially collapse, Duke reported on Saturday. The incident likely caused coal ash to run off into Sutton Lake, a Duke spokesperson told the AP. On Friday, Duke said it believes coal ash contained in one of the basins remains in place behind a steel wall that separates Sutton Lake from a site where the waste is still being excavated. That steel wall was under water, the company said, but an earthen part of the dam setting off the basin remained 2 feet above the surface. Another type of coal combustion byproduct, cenospheres composed mostly of alumni and silica, has flowed from that basin into Sutton Lake and Cape Fear River, Duke said. The second basin, which contains most of the sites ash, is about 10 feet from the floodwater and has not been affected, Duke said. Shares of Duke Energy, which were higher before the news hit, rolled over and were down less than 1 percent Friday afternoon. Hurricane Florence packed high wind and rain measured in feet to the Carolinas, followed by rising rivers and standing water in fields. 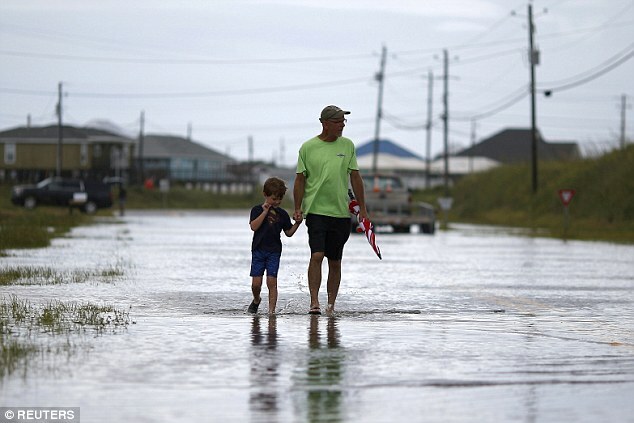 Florence made landfall on Sept. 13 as a Category 1 hurricane in a resort town just east of Wilmington, North Carolina’s eighth-largest city. The city of more than 117,000 people has been cut off by floodwaters. At least 42 storm-related deaths have been reported in the region, according to AP. David Fountain, president of Duke Energy’s North Carolina operations, told CNBC on Monday that the impact from Florence has been the most severe he’s ever experienced. “I’ve lived in North Carolina my entire life, and I’ve seen a lot of bad storms, a lot of bad hurricanes. But this is absolutely the worst, ” Fountain said. 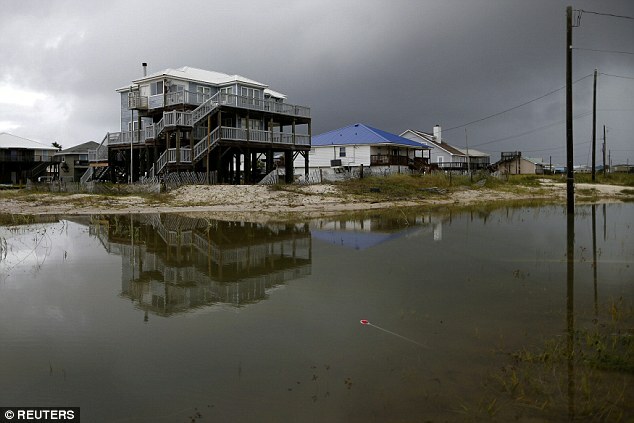 Property damage and disruption from Florence is expected to total at least $17 billion to $22 billion, but that estimate could end up being on the conservative end, according to Moody’s Analytics. The company estimates 49,000 homes and businesses were still without power late this week. Water is draining at a fast rate after the Sanford dam breached around 7:10 p.m. Saturday due to rains from Florence. The city, located in Brunswick County, took to Facebook and said the failure of the dam was due to the water volume over the last several days. The Big Lake began draining at a fast rate along with Pine and North Lakes. The Emergency Action plan was enacted and the city said no member of the public was at risk. At 7:10 pm this evening Sanford Dam failed due the water volume received over the last several days. The Big Lake will begin draining at a fast rate along with Pine and North Lakes. The City enacted it’s Emergency Action Plan and no member of the public was at risk. Alton Lennon, E. Boiling Spring Road and Hwy 87 are closed for the immediate future. Water is seen rushing through a spillway in a neighborhood below the Nuuanu Dam in Honolulu. Honolulu officials on Thursday prepared for the possible evacuation of 10,000 people from a residential neighbourhood after rains from a tropical storm dangerously elevated water levels in a reservoir. Olivia crossed the state Wednesday, dumping heavy rains on Maui and Oahu. Meteorologists say the tropical storm is now downgraded to a tropical depression moving west away from the islands. The city's Board of Water Supply said Thursday the water level in Nuuanu Dam #1 is about 1.5 feet (0.5 metres) below the spillway. The agency said it's been siphoning excess water to keep the water below the spillway but rains outstripped its siphoning capacity. It's also working with the fire department to pump water out of the dam to bring levels down further. The agency, which is the water utility for nearly 1 million people in Honolulu and surrounding towns on Oahu, said it would co-ordinate with the city on any evacuation notice. Meteorologists say moisture will linger through Friday, with additional rainfall of 3 to 5 inches (8 to 13 cm) and isolated amounts of 6 to 8 inches (15 to 20 cm) on higher terrain. A dam is breaching on the edge of Mississippi's Delta region after heavy rains during Tropical Storm Gordon, according to officials. The area near Black Hawk, about 70 miles north of Jackson, received more than 12 inches of rain Wednesday during Gordon according to radar estimates, senior Weather Service forecaster Mike Edmonston said. Carroll County saw widespread flash flooding with water entering some homes, and some farmers said their crops were significantly damaged. 'It seems to be holding a lot better than I would expect,' Myers said. However, he said it was still likely that the dam would fully breach. He said if it didn't wash away, officials would have to dig a trench to breach the dam themselves because it's unsafe. 'There's really not anything we can do as far as preventative action,' Myers said. Three houses have been evacuated in the rural area. The Mississippi Highway Patrol is blocking off Mississippi 16 and other roads, as water is expected to rise up eight to 10 feet on Abiaca Creek by Saturday. Edmonston said the flash flood would likely dissipate by the time it reached the table-flat Delta, about 15 miles west. The dam is one of more than 500 across the state built with federal aid to control flooding and erosion. Myers said this one is owned by the Abiaca Creek Drainage District. He said the Department of Environmental Quality had inspected the dam a few weeks ago. The inspector noted vegetation on the dam, which can create voids that water can travel through. But Myers said problems appeared minor, noting rain may have pushed water to a record high in the lake. 'Nothing was really a glaring problem th` I was aware of that would have alerted us that this dam was going to fail,' he said. 'This is one of the bigger ones in the last few years,' Myers said of the 60-acre lake. YANGON — Four people have died and three remain missing after a dam breach flooded a huge area of northern Bago Region, an official has confirmed. Daw Phyu Lai Lai Htun, a director in the Department of Disaster Management, said more than 36,000 people had also been displaced by the flooding as of August 30. The Swar Chaung Dam breached its banks early on August 29, inundating nearby Yedashe and Taungoo townships, damaging a bridge on the Yangon-Mandalay Expressway and closing the Yangon-Mandalay Highway. State media reported that the breach flooded Swar town and 85 villages, affecting more than 60,000 people. Phyu Lai Lai Htun said the Ministry of Social Welfare, Relief and Resettlement was providing cash to flood victims so they could buy rice. Those missing included a Tatmadaw major, a driver and a grade five student, she said. The government was still calculating the damage caused by the flooding, including the destruction of homes and infrastructure, she added. As many as 85 villages were flooded in Myanmar after a dam failed, unleashing waters that blocked a major highway and forced more than 63,000 people from their homes, a state-run newspaper said on Thursday. Traffic between Myanmar’s major cities of Yangon and Mandalay and the capital, Naypyitaw, was disrupted after the flooding damaged a bridge on the highway linking them. A sudden increase in the Kollidam River resulted in the shutters being washed away, but officials say the nearby areas aren’t in immediate danger. A portion of the Mukkombu dam near Trichy was washed away on Wednesday evening. According to reports, at least seven shutters of the regulator across Cauvery River was washed away along with the piers due to a sudden increase in the Kollidam River’s water flow. However, the officials claim that there is no immediate danger to the surrounding areas. Officers from the Public Works Department (PWD) attribute the cause to the heavy flow of water during the heavy rainfall period. They have also reportedly sounded an alert in the downstream areas of the river. In the past few weeks, the Cauvery River has been receiving around 2 lakh cusecs of water from Karnataka due to the heavy rainfall in the catchment areas of Krishnarajasagara and Kabini dam. The Kollidam River is essentially a flood carrier and begins from the Upper Anicut. The Upper Anicut is an important structure that was built to divert surplus waters into the river which will ultimately drain into sea. With the heavy discharge into the Cauvery River from Mettur dam, over 1.50 lakh cusecs of water got diverted into the Kollidam from the Upper Anicut for more than three days last week, as per reports. A few days back, a portion of the old road bridge across Kollidam River had collapsed owing to heavy water flow. As per reports, a portion of the pier of the Kollidam River’s old steel bridge developed cracks and started to cave in. The main reason for the bridge to collapse was the fissures in the 18th pier which broke and vanished inside the waters. The Tamil Nadu State Disaster Management Authority had also claimed that there was no danger due to the collapse and that people living in and around the area need not panic.